Teri Cochrane, an Integrative Practitioner and thought leader in functional epigenetic nutrition, has developed a way of eating called Wildatarian. She believes that it will help individuals gain awareness on how to reclaim their health, energy, strength, and joy for life! She will be releasing her new e-book Wildatarian – Eating as Nature Intended along with a program this spring. A dietary regimen consisting of the consumption of organic, wild-caught and sustainable animal proteins that have not been-industrially raised, processed, genetically-modified, hormonally or bacterially-supplemented or in any way divergent from their whole, natural form. This includes wild game meats and fowl such as Cornish Game Hen, bison, elk, goat, lamb, pheasant, quail, venison, wild-caught fish and shellfish; ancient, non-chemically-altered or treated grains, organic, non-mycotoxic legumes and produce and organic, non-hormonally-treated dairy products. One who consumes wild and sustainable proteins, grains, legumes and produce for vibrant, total-body health on a molecular level. Through her practice and the countless clients she sees each year, Teri has discovered that by consuming wild game meat and other unadulterated foods, the body is better able to balance itself. Case studies from her practice that illustrate how the Wildatarian approach has helped individuals reclaim their power and their connection to food. Many chronic health conditions such as Hashimoto’s disease, Lyme disease, undifferentiated connective tissue disease, pituitary tumors, and even cancer have been rebalanced. Here is why. Through scientific research and client work, her practice established that domesticated animal products— including beef and chicken —contain proteins called amyloids. The formation of amyloids starts when normal proteins in our body become truncated and/or misfolded. These proteins lose their normal function and begin to form thread-like structures called fibrils, which can attach to nerves, tissues, and organs and eventually lead to the buildup of plaque-like amyloids. These misfolded proteins can wreak havoc on our bodies. In addition, modern American gluten products and non-organic produce contain glyphosates, which are known toxins. The body’s metabolism and conversion of glyphosates can contribute to issues such as neurotoxicity and gut-brain imbalance. The Wildatarian approach avoids amyloids and glyphosates, and focuses on what foods to eat to regain and enjoy vibrant health! Teri’s research in biochemistry and biophysics has shown that many chronic conditions are caused or exacerbated in part by food intolerances or sensitivities to the mainstay ingredients of the modern American diet. Because these harmful ingredients are so prevalent, it is difficult to find recipes that both avoid them and are tasty and easy to make. Moving toward clean and healthy eating isn’t that difficult. “Whole” foods in their pure and natural state provide virtually everything we need to survive and thrive. They are the foundation for what makes up our intended dietary lifestyle as humans. Teri’s hope is that this Wildatarian approach will foster an appreciation for the deeper and sacred relationship we have with food—from market to table. Teri Cochrane is an Integrative Practitioner and thought leader in functional epigenetic nutrition. She received her Bachelors of Science degree with honors from the University of Florida, and she is a graduate of the Huntington College of Health Sciences, the National Leadership Institute. 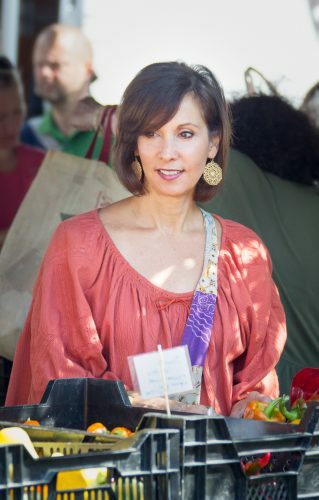 She also has extensive certifications and experience in holistic medicinal practices, such as Healing Touch, Craniosacral Therapy, Meditation Techniques, and Herbology. She has since developed her own methodology, “The Cochrane Method”. She is a writer, speaker, and maintains a nationally-read blog and radio presence. Teri is currently in private practice in the Metro D.C. area, where she specializes in extreme biotoxin illness, endocrine disorders, autoimmune including autoimmune Thyroid conditions and elite athletic performance. Teri’s approach and voice have been extended to the national level through appearances which include the syndicated TV show, Ask Dr. Nandi and the docuseries – “The Thyroid Secret”, from the production team behind the viral success “The Truth About Cancer”. Be sure to check out Teri’s website, www.tericochrane.com, and follow her on Facebook and Twitter. Questions or anything to add about Wildatarian? We want your thoughts, please. You might just help someone else in need.